The shoes that time forgot! 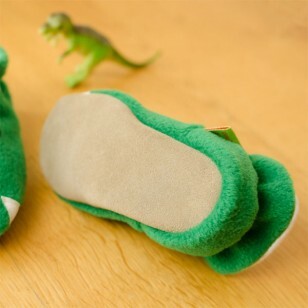 Our Funkasaurus has soft fleece uppers in 'dinosaur' green with gleeming white teeth and fiery red mane. These dinosaurs make super soft baby shoes and cool childrens slippers. 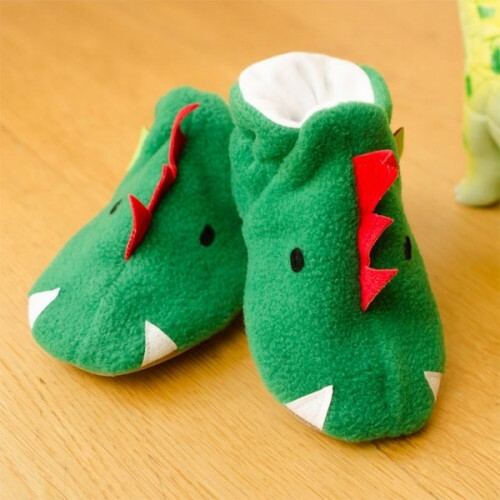 Our funky footwear makes an ideal gift for new born babies, terrific toddlers, cruising children or kool kids. 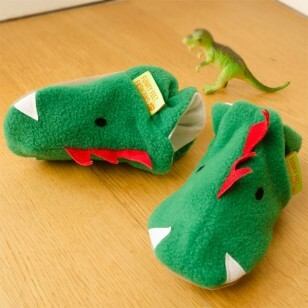 These dinosaurs are a pram shoe, a pre-walker, cool for crawling, safe for first steps and wicked for walking. They're perfect for nursery, kindergarten, school or home. Buying as a gift? Select the gift box option above & we'll write your message on the gift tag and tie the gift box up with a satin ribbon.